We have a philosophy when buying new household gadgets – particularly kitchen ones. If we think we need something we will invariably buy a cheap version of whatever it is to test out how much we do actually need it. The idea is that if said thing breaks within a year then we get a replacement under warranty and if said thing breaks after a year we have an idea whether or not we should invest in a more serious version of the gadget. This is great in theory. In practice, what happens is that we buy a cheap or moderately priced thing, we use it and it lasts forever. Our coffee machine was £50 – eight years and two countries later, it is still motoring along very nicely. Another great example is the cheap deep fat fryer. It’s a house brand model from one of the cheaper department stores and while it doesn’t get the beating the coffee machine does, it is used regularly (and loaned out regularly) and is yet to miss a beat. $30 well spent. 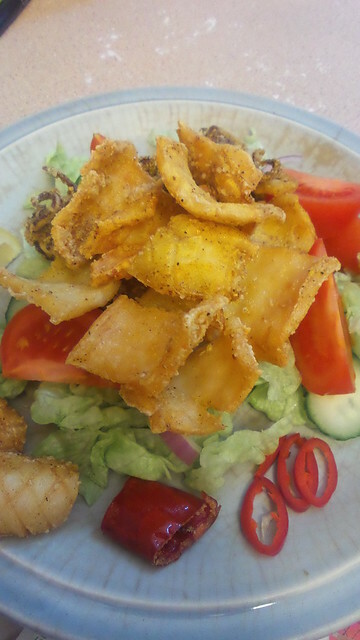 It has been over a year since we visited salt and pepper squid, and this time we used a recipe we got from a That’s Life bonus magazine. Unfortunately the recipe doesn’t appear to be online. I prefer the flavours in this approach – much brighter, more complex and with more depth. We deviated from the recipe (of course) because there were some ingredients we didn’t have (either at all or readily to hand) and we turned it into a one step process. Heat the oil in the deep fat fryer. Please the cornflour and spice mix in a plastic bag and give a good shake before either tipping into a bowl and coating the squid or putting a couple of pieces of squid into the bag and shaking. If you do put the squid in the bag, don't put lots of pieces in at once, otherwise they'll just clump together. Fry the squid in batches. Drain on kitchen towel and keep warm in the oven while you cook the remaining squid. Serve immediately with sliced fresh chilli for decoration.